Francisco black marble fireplace mantel is a French design. 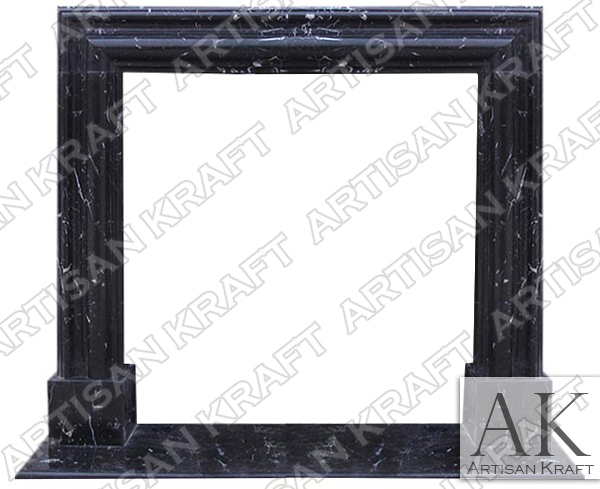 A frame style surround bolection surround, great for a traditional or modern home. A contemporary design that comes up to a firebox with or without inner panels. White veins detail the black setting. This is typically held in stock and on sale modern fireplace. Anything made from this stone has a certain unique feel to it. French influence makes the Francisco a must buy for any style house. Install it in a formal traditional setting or in a less formal modern apartment. Either way this design will surely demand everyones attention. This model can be seen in our showroom in Chicago installed without the inner panel surrounds in a matte finish. Modern bolection and fit for a great city like San Fransisco. Typical Dimensions: 56″ wide x 48″ high *can be made to custom dimensions. Stone: Black Marble, GFRC, travertine, limestone, sandstone, marble etc. Available in many different colors, textures and finishes.